Uniworld has a few different options for Douro River cruise itineraries, and each is unique. Packages are between 8 and 13 days and may also include a visit to Lisbon, Madrid or to both cities. There are two itineraries available – Portugal, Spain & The Douro River Valley and Jewels of Spain, Portugal & The Douro River. Each package has distinct features for its river cruise component. Some destinations visited are listed in only one of the itineraries and not the other. Also, the order in which the destinations are visited is different for both packages. A couple of other differences are also noted. One river cruise is round trip from Porto, and the other is one way from Porto to Vega de Terrón. The other major difference is that one of the packages has the option for a river cruise only, while the other does not. Now, let’s take a look at each of the itineraries that Uniworld offers. Main lounge on Queen Isabel. Photo courtesy of Uniworld. This is an 8- to 11-day itinerary. The 8-day package is for a river cruise only and is round-trip from Porto. The other is an 11-day package from Lisbon to Porto. It includes three days visiting Lisbon in addition to the Douro River cruise. Please note that only one option is available for each sailing. In other words, you can book the 8-day package only on certain dates and the same applies to the 11-day itinerary. Embarkation takes place on the Queen Isabel. The ship carries up to 116 passengers, with staterooms that are between 161 square feet and 323 square feet in size. We’re going to look at the 8-day river cruise first, and then look at the three extended days in Lisbon. For the 11-day itinerary from Lisbon to Porto, the visit to Lisbon precedes the river cruise. 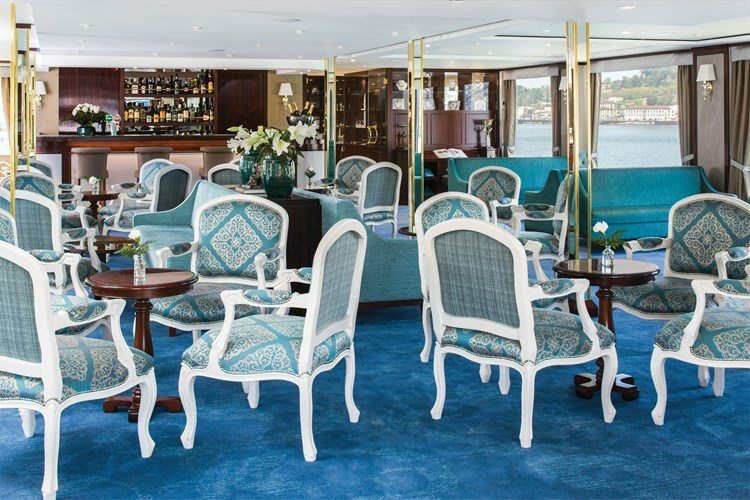 On the first day of your river cruise, you’ll board the Queen Isabel in Porto. The first evening will be spent on the ship where you’ll be served dinner and have the opportunity to meet your fellow passengers. On day two, you’ll be able to choose between two different excursions. The first is a guided tour of Porto. This Portuguese city is a designated UNESCO World Heritage Site, comprised of the Historic Centre of Oporto, Luiz I Bridge and Monastery of Serra do Pilar. The other excursion is a “Do as the locals do” walking tour of Porto. You’ll visit the Livraria Lello, a local bookstore that is well established among the locals. And you’ll walk through the São Bento railway station, which is decorated with beautiful wall panels revealing some of Portugal’s history. After departing Porto, the Queen Isabel cruises eastward. On the third day of your trip, you’ll visit the Douro Museum in Régua where you’ll learn about the region’s history of wine-making. This area, known as Alto Douro Wine Region, is another of Portugal’s designated UNESCO World Heritage Sites. On day four, you’ll be able to take a guided tour of Old City Salamanca. Or you can choose instead to take a small boat cruise through the International Douro Natural Park, which is located on a part of the Douro River that is accessible by small watercraft only. You’ll spend some time cruising on the Douro River on day five as you begin your return trip toward Porto. Along the way, there are more sites you’ll be able to see, though. You’ll have the choice of visiting Castelo Rodrigo or Coa Valley Museum while your ship is docked in Barca d’Alva. In the evening, you’ll enjoy dinner at Quinta da Assevada – a vineyard and winery located on a hilltop in the heart of the Douro Wine Region. Two excursions are available for day six. You can choose to take a guided tour of Quinta do Seixo where you’ll also be able to sample its wines. Or you can take a hike through the vineyards and enjoy a wine-tasting at a local quinta. On day seven, you’ll return to Porto for the last day of your cruise. You’ll have the opportunity to take a guided tour of the Old Town in Guimarães or the “Soul of Porto” walking discovery tour in the Ribeira district. Your river cruise will end in Porto on day eight. After breakfast, you’ll disembark and be transported to the airport for your return flight home. For the 11-day itinerary, your trip will begin in Lisbon and will be followed by the 8-day river cruise. You’ll arrive at the Portela Airport in Lisbon and transfer to your hotel. There are no planned excursions for the first day. On day two, you’ll take a guided tour of Lisbon. The largest city in Portugal, Lisbon is located at the mouth of the Tagus River. You’ll be able to explore Lisbon on your own on day three. In terms of activity and sightseeing, there’s much to see and do in the Historical Lisbon, Global City – designated as a UNESCO World Heritage Site in 2017. On day four, you’ll depart Lisbon by motorcoach to Porto, where your Douro River cruise will begin. On your way, you’ll stop in the city of Coimbra, which is located on the Mondego River. It’s the third largest city in Portugal. The University of Coimbra is another designated UNESCO World Heritage Site in Portugal. You’ll tour the university’s Joanina Library, which houses more than 300,000 books. After your tour in Coimbra, you’ll travel to Porto to begin day one of your river cruise, which is described in the previous section. Uniworld’s Douro river cruises are available from April through November. Starting prices for the Douro River cruise only are from $2,399 to $4,899 per person. Starting prices for the Douro River cruise plus a 3-night stay in Lisbon are from $2,999 to $5,499 per person. This is a 13-day itinerary between Lisbon and Madrid. 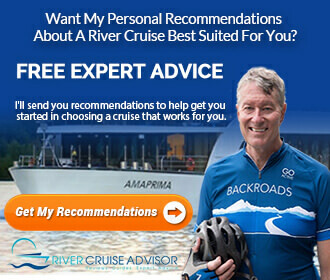 There is not an option for a river cruise only as there is with the other itinerary. The river cruise is one way from Porto to Vega de Terrón. So you’ll visit Lisbon prior to the Douro River cruise. And you’ll visit Madrid following it. Your trip with begin in Lisbon. On the first day, you’ll arrive at the Portela Airport and transfer to your hotel for a 2-night stay. On day two, you’ll take a guided tour of Lisbon and have some time to explore the city independently. You’ll depart for Porto on day three to begin your river cruise. You’ll first stop at the small village of Óbidos for a guided tour. After the excursion, you’ll contiue northward toward Porto where you’ll embark on the Queen Isabel. Dinner will be served on board. The next day (day four), you’ll have the option to take a guided tour or Porto or to participate in the “Do as the Locals Do” walking tour of Porto. There are two excursions available for day five. You can choose to participate in a Guimarães city tour or you can choose to take a walking discovery tour of the Ribeira district of Porto, which is one of the city’s oldest neighborhoods. On day six, you’ll travel to Entre-os-Rios where you’ll be able to visit the Quinta Alveda gardens or take a walking tour of Amarante, which is located on the banks of the Tâmega River. There is also a featured excursion to the Douro Museum following both of these tours. As you continue to travel eastward along the Douro on day seven, you’ll stop in Régua. The featured excursion is a guided tour of Lamego. This city is located about ten miles south of Régua on the Balsemão River. While in Lamego, you’ll visit the 18th-century Shrine of Our Lady of Remedies and enjoy a wine-tasting at a local quinta. After this excursion, you’ll return to the ship for your scenic cruise toward Pinhão. On day eight of your trip, you’ll have a few tour choices while docked in Pinhão. You can choose to take a Quinta do Seixo guided tour with wine-tasting; you can visit the vineyards and winery at a famous family-owned estate in Pinhão; or you can visit the city of Amarante. There are two excursions available on day nine. You can visit the historical village of Castelo Rodrigo, or you can take a small boat excursion through International Douro Natural Park on a part of the Douro River that is not navigable by larger vessels. The boat excursion includes an optional scenic hike. 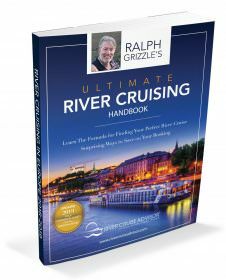 Your river cruise will conclude on day 10. You’ll disembark in Vega de Terrón and transfer by motorcoach to Salamanca for a guided tour of the city. The Old City of Salamanca is a designated UNESCO World Heritage Site. Later in the day, you’ll be transported to Madrid, which is about 133 miles southeast of Salamanca. Day 11 features an excursion to the Prado Museum – a famous art musuem in Madrid that houses several pieces of European art with some dating back to the 12th-century. In the evening, you’ll enjoy a dinner with a flamenco show. The following day, you’ll travel to Toledo, which is located about 57 miles southwest of Madrid. The Historic City of Toledo was designated as a UNESCO World Heritage Site in 1986. This will be the last full day of your trip. You’ll take a guided city tour and then have the opportunity to explore the city independently. Your trip will conclude in Madrid on day 13. You’ll check out of your hotel and transfer to the airport for your return flight home. Itineraries are available from April through September. Starting prices are between $4,399 to $7,799 per person. So, how can you decide which itinerary is the best option? Well, if you just want to take a river cruise, then the 8-day Portugal, Spain & The Douro River Valley is the best choice. And if you want to spend a few extra days in Portugal visiting Lisbon, then the 11-day variation of this itinerary would be a better choice. If you’d like to extend your trip to include Lisbon, Madrid and Toledo, then the 13-day Jewels of Spain, Portugal & The Douro River is a great option.